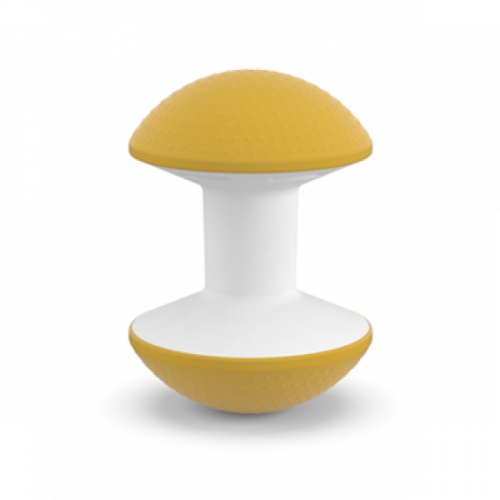 Ballo is designer Don Chadwick’s vision of what a multipurpose stool should be—fun, engaging and perfect for short-term, active sitting in the home or office. With a compact central column and lightweight air-filled domes, Ballo is an imaginative take on traditional ball chairs, supporting flexibility and freedom of movement. Available in a variety of vibrant colors, Ballo has a dynamic nature that allows it to integrate into a wide range of environments. Studies show that comfortable employees are happier and more productive. In the modern workplace, the ability to move is increasingly important for overall comfort and well-being. Ballo makes movement effortless, while its lightweight design makes it easy to transport for spontaneous use. Ballo combines functional, innovative design with the playfulness of an exercise ball. Its counterweighted base helps Ballo remain upright for stable movement and convenient storage. The result is a multipurpose stool that allows users to move with ease. Weighing just 13.5 pounds and fitted with hand-holds for easy portability, Ballo is the perfect match for any space where short-term sitting and flexibility are priorities. It’s the ideal multipurpose stool for collaboration spaces, cafeterias and reception areas, as well as traditional workspaces and home offices. Ballo was designed to stand the test of time. Its classic design and durable materials make it a valuable investment for any space. Made from non-slip TPV material, Ballo’s symmetrical top domes are easy to clean and its compact shape makes storage simple. "I have been faced with back problems for several years. I've tried chairs, stools, kneeling apparatuses, bouncy apparatuses, and plain standing but nothing compares to the fast recovery and increased strength i have experienced with Ballo. Ballo is sturdy and well-built which means I can actually do bending and balancing on it that I couldn't do with other products. Not only is it strength building it also provides a stretch that is hard to get by other means." The Ballo stool was created by renowned industrial designer Don Chadwick to promote workspace flexibility, freedom of movement and comfort. Meaning “to dance” in Italian, Ballo conjures a sense of movement, fluidity and grace. The ultimate multipurpose stool, Ballo is the perfect partner for the modern workspace.